"He's the man who's haunting me." Just how seriously can we take Douglas Sirk in an age so saturated with irony? His films are relentlessly overwrought, yet there's nothing winking or knowing about them�they're soap operas made in deadly earnest, and if even a little bit of cynicism crept into them, they'd probably be unwatchable. There are die-hard Sirk cultists, some of whom seem deeply committed to the director and his work, others who seem to be into it as part of an elaborate put-on. (It's like me trying to make a persuasive case to you that the great rock act of the 1980s was K.C. and the Sunshine Band.) 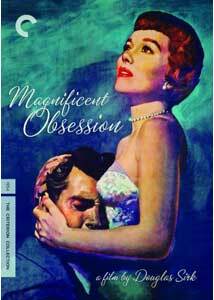 If you're looking for a first taste of Sirk to see what the noise is all about, or if you're a purist and Sirk completist, this handsome DVD release of Magnificent Obsession is a great place to start. Similarly, there's an almost New Age, Christianity Lite vibe to much of this�we learn that the late Dr. Phillips was a grand benefactor, making gifts of almost all of his earnings to those in need. For one thing, it means that his widow isn't nearly as financially secure as she might have imagined, and that there's an army of those who have benefited from the doctor's largesse, who have been asked not to pay it back, but to pay it forward. The doc's best friend is a painter named Randolph, played by Otto Kruger, who functions as Merrick's conscience, or his guardian angel�the violins swell whenever he shows up on screen, and Rock's emotional journey is about moving from a total lout to one who serves others. It's actually a little creepy and weirdly paternalistic, especially in regard to keeping your family completely in the dark when it comes to estate planning. The cheap shots come a little too easily when it's time to talk about Sirk movies, I guess, and they shouldn't�you both find yourself thinking that what's going on is completely ludicrous, and yet getting swept along by the grandeur of its emotions. Especially notable in the supporting cast is Agnes Moorehead, as a nurse who stands by the Phillips family during a tsunami of unthinkable crises, and the performance is sort of a weird halfway point between her turn as the mother of Charles Foster Kane and her recurring role as Endora, intergalactical nightmarish mother-in-law of Darren Stevens. Image Transfer Review: If you really want to get into it, surf on over to criterionforum.org, and re-open the scab that's started to heal over the debate about the aspect ratio of this movie. You're probably better off sticking to the pretty pictures, however, and Russell Metty's smashing Technicolor cinematography looks, well, magnificent in this saturated, dewy transfer. It's a delirious serving of eye candy. Audio Transfer Review: The Ode to Joy chorus swells in the string section a few times too many on the soundtrack, and dynamics in the mono offering can be stunted, but it's all sufficiently clear. Extras Review: Certainly the most notable extra is the inclusion of the 1935 version of the film (01h:42m:05s), directed by John M. Stahl and starring Irene Dunne and Robert Taylor�it's about as soapy as Sirk's version, though perhaps not as emotionally lurid. (Both films are based on a novel by John C. Douglas.) It can feel like a bit of overkill to watch them back to back, but the opportunity to compare and contrast, and to see just how Sirk put his stamp on the material, makes this an auteurist feast. The second disc also includes From UFA to Hollywood: Douglas Sirk Remembers (01h:22m:31s), a 1991 documentary directed by Eckhardt Schmidt, consisting almost entirely of interview footage with the director shot in 1980. It's in German, Sirk's native tongue, and though he discusses his American years extensively, Magnificent Obsession only gets a few passing mentions. Back on the first disc is Thomas Doherty's fine commentary, which provides lots of biographical information Sirk, goes over the aspect ratio discussion, discusses the constriction of gender roles on screen in the 1950s in comparison with earlier decades, and charts the ebbs and flows of Sirk's reputation. (Rainer Werner Fassbinder was Sirk's biggest cheerleader, and more than anyone is responsible for the rehabilitation of the director's reputation in the 1970s.) Jane Wyman talks directly to us in an original trailer, which is a bit unnerving; and in accompanying interviews from 2008, filmmakers Allison Anders (9m:10s) and Kathryn Bigelow (13m:17s) discuss their affection for Sirk's films. These are alas more about the interview subjects than about Sirk, though it makes you wonder if there's something particular in Sirk's work that brings out that confessional streak. The accompanying booklet features an informative essay by Geoffrey O'Brien, and lots of saturated color photographs. Madly overwrought, like all the best Sirk pictures are, the film is beautifully presented here and comes with a persuasive package of extras.